For RSR's Asteroid & Peanutoid Information: See just below! * Hydroplate Expert Kevin Lea Talks about Comets: God did not create the Earth with comets and asteroids aimed at it. So what brought about this danger? In a special edition of Real Science Radio, Bob Enyart and Kevin Lea, a Washington state pastor with a background in nuclear physics, talk about comets: their size, speed, orbits, composition, and lifespan, and origin! They discuss the short lifespans of comets, their composition and orbits, all of which show that comets originated from Earth. The Bible records that the fountains of the great deep broke forth and flooded the Earth and, as it turns out, launched comets into space! 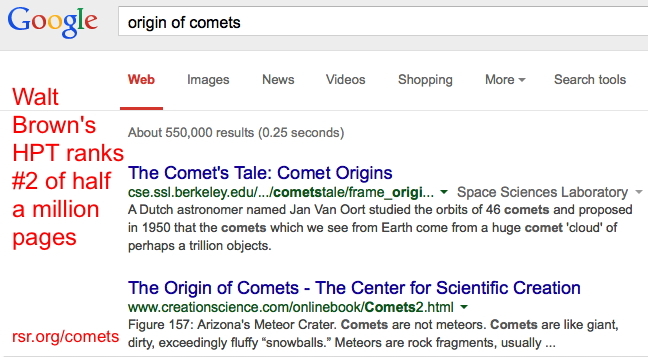 Yes, every single comet came from Earth. Check out Walt Brown's fabulous chapter on The Origin of Comets! 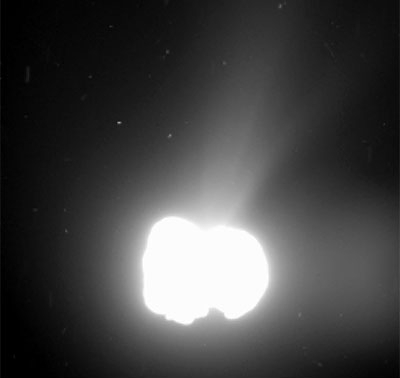 Hear also the conclusion of this fascinating discussion in RSR: Comets II. 2013 Update 1: See this fun affirmation of Walt Brown's comet theory, in David Mathisen's comet in the asteroid belt blog. 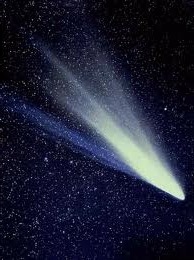 2013 Update 2: For more evidence for the Hydroplate Theory and its origin of comets explanation, see Comet ISON is Comet 1680 returned. 2014 Update 1: Hubble telescope photographed the "mysterious" breakup of an asteroid. This is not a mystery but instead is expected by students of the hydroplate theory, as explained in Kevin Lea's note below. 2014 Update 2: Asteroid trio gives Earth a close shave (from a triple-blade razor :). 2014 Update 3: In related news, see Pastor Lea's letter to Vladimir Putin regarding Pastor Saeed Abedini unjustly held in an Iranian prison. 2014 Update 4: Cosmonauts find sea plankton on the outside of the International Space Station! 2015 Update: Another confirmed creationist prediction (see just below) this one regarding comets comprised of rounded rocks. 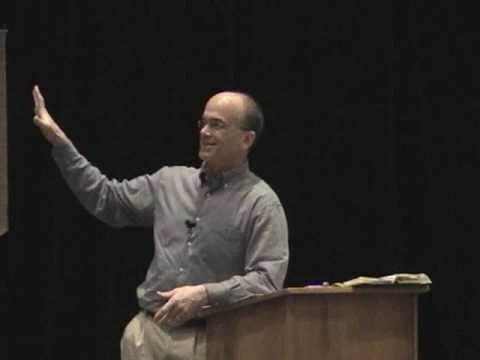 * Another Confirmed HPT Prediction, Rounded Boulders on Comets: Regarding the confirmation of yet another astounding science prediction, in January 2015, Bob Enyart interviews Dr. Walt Brown, author of the hydroplate theory explanation of the global flood and the many resulting broken features of our Earth and solar system. 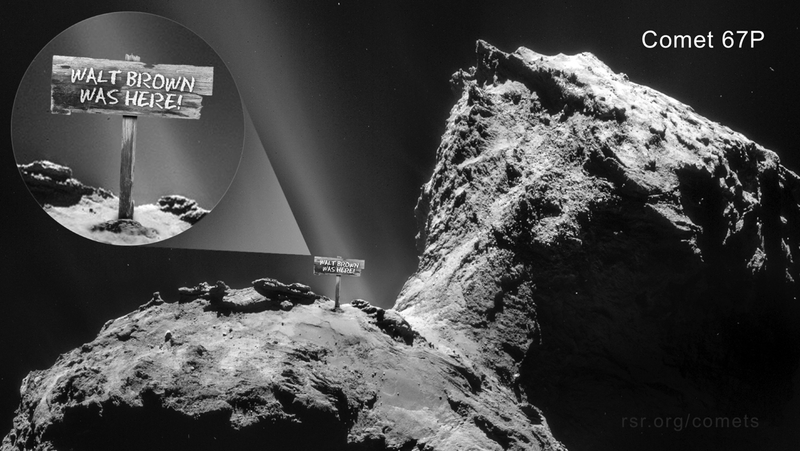 The European Space Agency has just released high-resolution images of Comet 67P along with the assessment of their scientists that they may have found unexpectedly large rounded boulders (up to 10-feet in diameter) that may be the comet's building blocks! This interview presents this latest discovery which, though it has shocked so many secular astronomers, has confirmed Walt Brown's specific prediction, published 13 years ago in the 7th Edition of his book In the Beginning, about the composition of comets. See more at rsr.org/predictions. 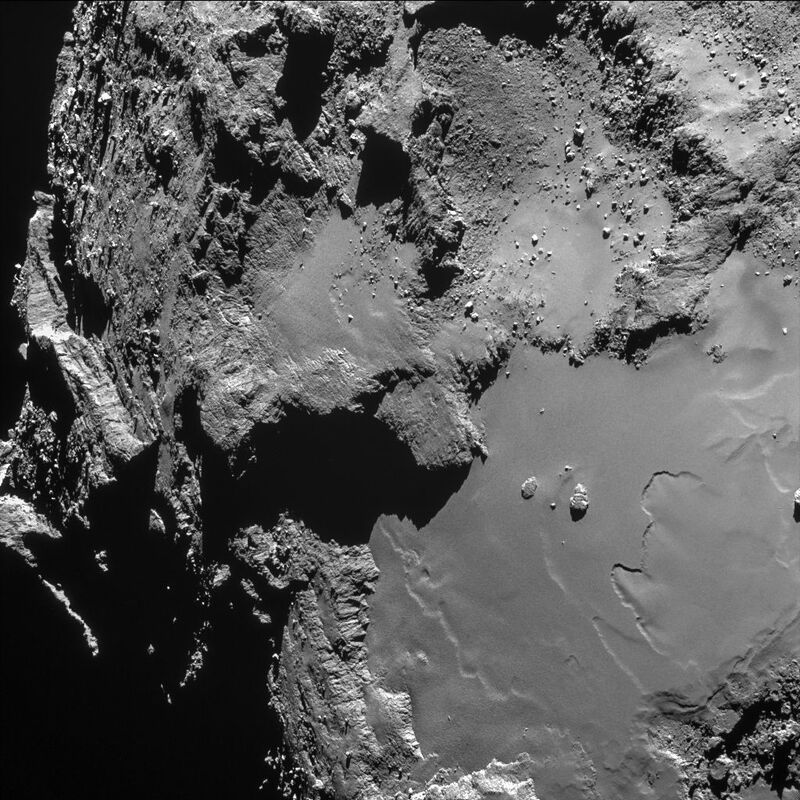 * Landslide Photographed on Comet 67P: In a related story and now added to our RSR's List of the Solar System's Transient Events, the European Space Agency has photographed an actual landslide on Comet 67P. 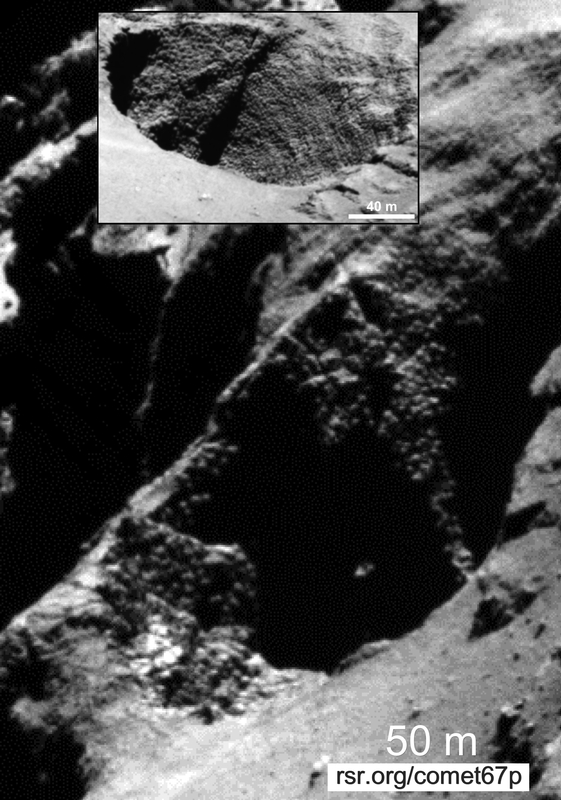 Just like every planet and all the other kinds of bodies in the solar system, this allegedly four billion year-old flying pile of rounded boulders produces transient events, that is, passing phenomena, like 67P's landslide and outgassing oxygen, that would be unexpected to see on billion-year-old objects. As for this landslide, of course stable cliffs are not easily built with rounded boulders, so catching a landslide photographically as it happens is not shocking, as it is to old-earthers, but expected, as it is to students of the hydroplate theory! 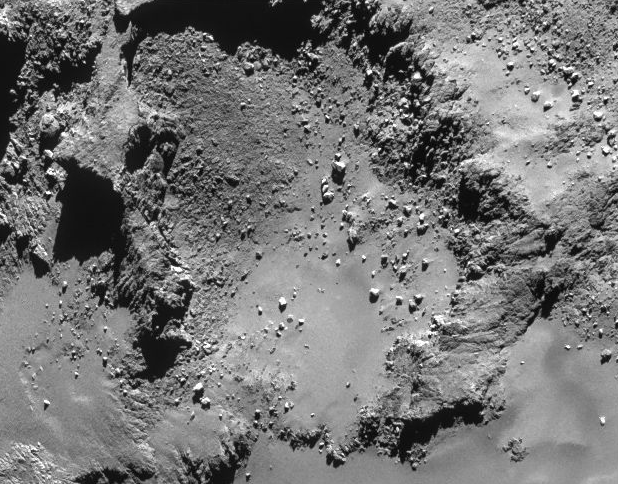 As the Rosetta spacecraft approached the comet, it measured gas and dust near the comet for six weeks. "In the same period, first measurements from the Microwave Instrument for the Rosetta Orbiter, MIRO, suggested that the comet was emitting water vapour into space at about 300 millilitres per second," according to the ESA. That's over six-thousand gallons per day! At that rate, the whole comet—assuming it's made entirely of water ice—would melt into space after only hundreds of thousands years. - Asteroids are not from an exploded planet. (Their combined mass hardly equates to a small moon.) See RSR's Asteroid challenges naturalism, supports Walt Brown. - Asteroids, including the one that struck the Sudan desert in 2006 contains diamonds with inclusions common to diamonds on Earth "such as chromite, phosphate and iron-nickel sulfides", like meteoroids, comets, and TNOs, are composed of minerals common to Earth. - With the solar system's many old-age-busting transient events, Hubble photographed what is to secularists a "mysterious" breakup of an asteroid. Asteroids will be shown to have debris fields orbiting them. That is, the percentage of asteroids known to have moons will continue to grow, contrary to materialist expectations (because of the physics challenge of an asteroid capturing one moon, let alone two or more). Also, we will find asteroids with orbiting debris and multiple moons. This standing prediction was partially confirmed when RSR said on September 1, 2017 that there was a significant likelihood that the Florence flyby may show that it has "one or two moons". Five days later, NASA announced and the science media headlines reported, "Asteroid Florence has Two Moons"! Partially confirmed again on July 11, 2018, "Object [2017 YE5] is Actually Two Asteroids Orbiting Each Other & It’s Freaking Scientists Out" per Bustle (of all outlets) and NASA. - For the 2017 flyby of asteroid 3122 Florence, based on RSR's creation model, we said that it very well "may have a moon in tow... In fact, it might have a couple moons." Five days later NASA and the science headlines announced: Asteroid Florence has two moons! See more. - A "twin asteroid", 65803 Didymos, in the news in 2017. - For more on asteroids with moons, see also this nearby asteroid trio. - Check out our friend David Mathisen's HPT-based comet in the asteroid belt report. - 624 Hektor, elucidated by Hawaii's Keck Telescope, which is a peanut-shaped asteroid with a moon! See also Nat'l Geographic's report. - In 2017, 2014 JO25 was discovered to be peanut-shaped! - In 2018, perhaps 50% of the small bodies in the Kuiper Belt are believed by Lowell Observatory and Carnegie Institute astronomers to be contact binaries according to the Astronomical Journal! - In 2019, the TNO Ultima Thule contact binary was photographed a billion miles beyond Pluto (see below)! * NASA Admits Peanuts Are Mysteries: A NASA mission scientist and member of their Jet Propulsion Laboratory, Donald Yeomans, explained why Itokawa and peanut-shaped asteroids generally contradict the physics-based expectations of old-earth scientists. It's a major mystery how two objects each the size of skyscrapers could collide without blowing each other to smithereens. This is especially puzzling in a region of the solar system where gravitational forces would normally involve collision speeds of 2 km/sec [4,500 miles per hour]. * Yet 10% of Close-Up Asteroids Are Peanuts: To multiply this peanut evidence against secular expectations, according to old-earth astronomer Dr. Al Grauer with Travelers in the Night, data from the Goldstone Solar System Radar telescope and the Arecibo Observatory in Puerto Rico suggests that of near-earth travelers larger than 650 feet in diameter, more than 10% of these asteroids have a peanut shape. And by the way, so was Arthur C. Clarke's fictional asteroid Kali. And so are the very real comet nuclei of 19P/Borrelly, 103P/Hartely, Halley's Comet, and the famed 67P which (undoubtedly like countless others) is known to be made up of millions of rounded boulders. Remember, all scientists work for Walt Brown! * Binary Comet/Asteroid: Again from our all-scientists-work-for-Walt-Brown file, in September 2017 the journal Nature published the discovery of a binary asteroid/comet hybrid. Wow! "Rapid rotation" is one of the (unworkable) explanations claimed by secular astronomers for binary asteroids. Secular astronomers, though mostly ignorant of the Hydroplate Theory formation of comets and asteroids, nonetheless make frequent discoveries consistent with and in confirmation of HPT creation science predictions! * Peanut Asteroid Craters? Would peanut-shaped asteroid impacts form circular craters? Or might their craters, depending on their orientation at impact, be somewhat deformed? National Geographic published a list of the ten biggest known impacts on Earth. Do any of them appear to have been caused by a peanutroid? With perhaps just over ten percent of the larger near-earth asteroids being peanut shaped, that alone might suggest why we may never have been hit with a peanut-shaped asteroid. Or, might an understanding of the origin of asteroids (and of comets, meteoroids, and TNOs) help to explain why it would be even less than statistically likely that we would get hit by a dually than by a unary impactor? * 2019 Photo of Another Contact Binary: NASA's New Horizon, a billion miles past Pluto, photographed yet another contact binary, Ultima Thule! 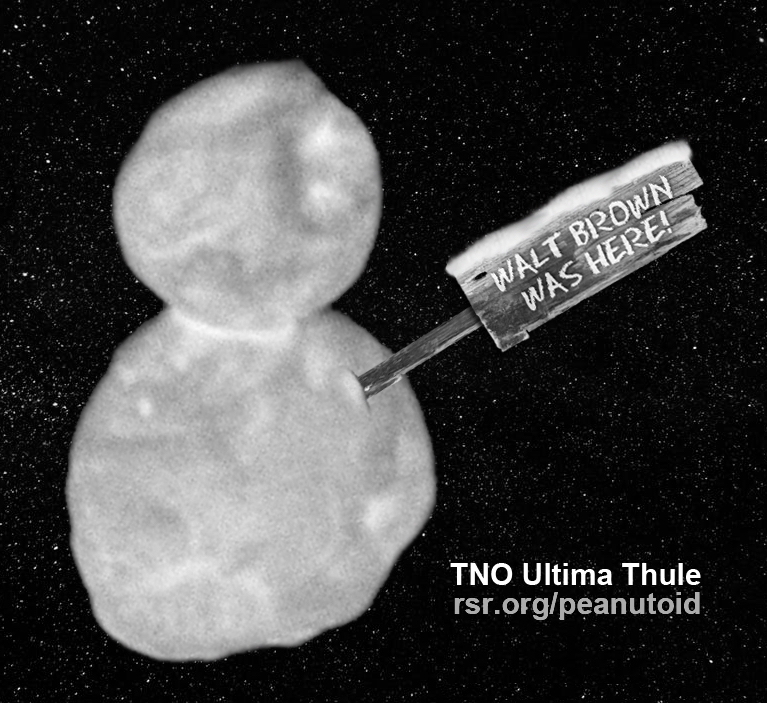 Previously, regarding such binaries (or snowmen), in a moment of candor NASA admitted that such "peanuts" are mysteries. Mission scientist and member of the Jet Propulsion Laboratory, Donald Yeomans, explained, "It's a major mystery how two objects each the size of skyscrapers could collide without blowing each other to smithereens. This is especially puzzling in a region of the solar system where gravitational forces would normally involve collision speeds of [4,500 mph]." All scientists work for Walt Brown! 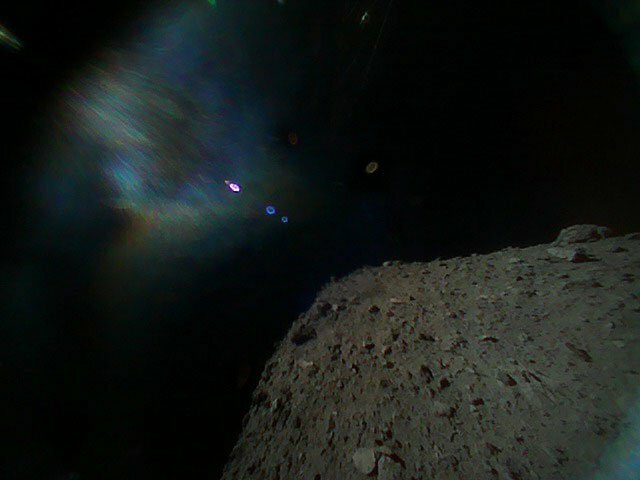 * 2018 Photo of Another Flying Rockpile Asteroid: All scientists work for Walt Brown, including in Japan! The Japanese Aerospace Exploration Agency landed two small rovers on the asteroid Ryugyu on Sept. 21, 2018 and found yet another HPT-compliant flying rockpile! * Thanks to an RSR Volunteer: RSR thanks one of our volunteer researchers for transcribing the JPG image of John Buchanan's 1905 Letter to the Editor. The image and transcription of the insightful, anti-evolution letter are over at rsr.org/john-buchanan. * Today's Resources: Check out RSR's Global Flood & Hydroplate Theory video (on DVD, Blu-ray, or download). And you can enjoy the 6-disc standard audio CD set The Hydroplate Theory & Dr. Walt Brown on the Air or get the entire set on a single MP3 CD, both of which contain eleven radio programs. Bob Enyart also highly recommends Dr. Walt Brown's fabulous book, In the Beginning! Order by clicking the link, or calling us at 800-8Enyart (800 836-9278)! * Another Great Resource: You can help us stay on the air by purchasing the Real Science Radio Collection, a handy set of MP3 CDs with all of our shows from 2006 to 2011. Also, you can enjoy Bob Enyart’s entertaining and insightful videos each month, mailed to you automatically, simply by subscribing to the BEL Monthly Topical Videos service! And please check out our other great BEL subscription services! This March 6, 2014 observation of a disintegrating asteroid is surprising to NASA scientists but not to Dr. Walt Brown, the author of the Hydroplate Theory explanation for the flood of Noah. ...the evidence we have pertaining to asteroids and comets supports Dr. Brown’s theory that they originated from the earth. You can search for: origin of asteroids and find that Google ranks Dr. Brown’s theory as the #1 hit (at creationscience.com) out of millions. The hydroplate theory explains that before and during the flood of Noah, tidal effects caused the temperature and pressure of water under the earth's crust (subterranean water) to increase. The crust eventually ruptured, allowing the now supercritical water and associated rock debris to jettison into space, some at velocities sufficient to escape earth's gravity. Dr. Brown shows further how some of this water and debris coalesced to become comets and other debris formed into asteroids. Brown’s theory predicts that most asteroids are actually rock piles held together by gravity and ice. If the rock pile is perturbed in a way that exposes the underlying ice to the vacuum of space, it will begin to sublimate and create a thrust vector that in some cases could accelerate chunks of rock sufficiently to overcome the weak gravitational attraction, resulting in the asteroid flying apart as the Hubble telescope has observed. The resultant pieces are now miniature comets for reasons explained in Dr. Brown’s book. In the Beginning is available as a full-color hardback and can be read online. See also his Asteroids and Comets chapters, and you can get a PDF of this note at calvarypo.org/HANDS/1150.pdf. - the 365-day year (and see our 360dayyear.com website). * God's Design of the Storehouses of the Great Deep: For a million species, as a contingency for the Fall, from the start God designed the robust survival capabilities that organisms would need to thrive on Earth after it lost its initial perfection. The Bible teaches that the rebellion did not only break mankind, but that it broke even the cosmos itself. God also designed the Earth with waters reserved for judgment as a contingency, that would perhaps be automatically activated, in the case of mankind's rebellion. That contingency planning may have included a goal that went further, distance-wise, than just the terrestrial judgment of mankind. An additional design goal of God's work on Days 1, 2 and 3 of creation may have been to ensure that if man's sin spoiled the perfection of creation, that this same corruption would be manifest throughout the cosmos. Thus, by God's original design of the Earth, the Fall and the resultant eviction from the Garden may have led inexorably to the Flood. And then, by the destructive force of the fountains of the great deep, the damaging of the solar system itself (including the impactors that marred the Moon, Mercury, Venus, and Mars), may have resulted from God's intentional contingency planning in the original design of the Earth. * Gravity Homeschool Science Experiment: For older children, from Ellen McHenry's Hydroplate Theory for Kids, check out How Gravity Works in Outer Space to help students understand the formation in space of asteroids and comets from debris ejected from earth. 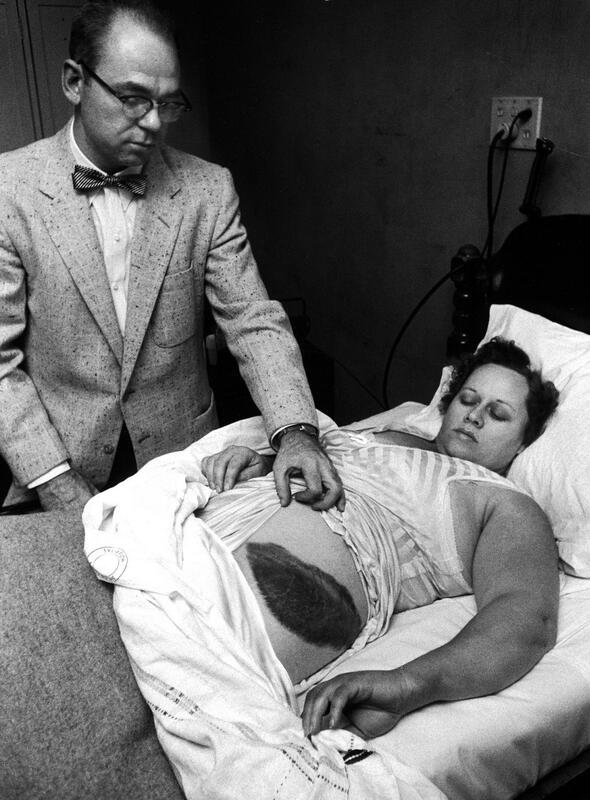 * Meteorite Hits Alabama Woman, and Other Dangers: National Geographic reported on Ann Hodges, pictured right, being attended to by her physician Moody Jacobs after she was struck by a softball-sized meteorite that crashed through the roof of her Sylacauga, Alabama home. More recently, in 2013, a meteorite exploded 12 miles above Russia with the force of 30 Hiroshima-sized atomic bombs, breaking windows in six cities and causing 1,500 people to seek treatment for injuries. The errant "bullets" flying through the solar system were evidently not a part of God's "very good" creation but resulted from the judgment of the global flood of Noah's day as discussed at rsr.org/hpt. * 1:10:50 into RSR's Global Flood Video: You might want to watch RSR's Global Flood and Hydroplate Theory video (or buy it on DVD or Blu-ray to share with a friend). And you can see a brief mention about the loss of paradise using meteoroids as an example, and then see, embedded below, RSR friend and aerospace engineer Bryan Nickel's video on the origin of asteroids, meteoroids, and comets.